You are currently browsing the Dublin Event Guide weblog archives for July, 2017. The Dublin Event Guide is now complete and I hope the preliminary version with all Saturday events but some missing events during the week helped you earlier today. The final version now has over 195 events in it and all are free. The financial side is looking up a little. Thanks to more support last wee, we now have managed (Just in time!!!) to cover all outstanding bills in full! That’s great news! But the next bill of EUR 240 is only a few days away and we need to find again that amount within 30 days, so the battle continues! So PLEASE please help via PayPal here even if you only have a few Euro, everything counts!! And don’t forget that you can also help without spending a cent of your own money, if you buy through the advertisement links that are in the Dublin Event Guide or that are on the Dublin Event Guide Shopping Page at www.DublinEventGuide/shop If you want to buy from Groupon or LivingSocial or Amazon or Bookdepository or eBay or Asos or New Look or PrettyLittleThing or SportsDirect, just go to that website and click on the relevant link and it will bring you to the right place. The company you buy from will take 5-8% out of their profit (depending on the company) and will reward the Dublin Event Guide for promoting that company. But importantly you don’t pay more! Here are the links: www.dublineventguide.com/shop Thanks for using this page! The Dublin Event Guide needs your continued help in two areas: Your donations help paying the bills for sending the Dublin Event Guide every week. Just 1 Euro per month (12 Euro per year) would be great, more would be even better. Unfortunately not many subscribers are prepared (or able) to help, so please don’t rely on others! Your money will be used to pay the monthly EUR 240 bill for sending the newsletter using MailChimp, for web hosting and domain names. I am happy to work 35 hours on the Dublin Event Guide every week without making anything from it, but for the bills I need your help. You can make your donation at www.perfectresults.info/donate.htm using Paypal or CreditCard or send me a mail at dublineventguide@gmail.com if you prefer to pay by bank transfer. Corporate or enterprise sponsors are very welcome too and will get a bundle of benefits as a thank you for their donation, contact me on sponsorship@dublineventguide.com to discuss the details. And here is the second area where you can help: Without you spreading the word we would have never reached 24,000 subscribers and 72,000 Facebook Likes. Send your friends to www.dublineventguide.com where they can subscribe as well. This week I will present a song to you in the Feel Good Slot. If you grew up in Ireland and are of a certain age ;-) you will know that song well, but the song was released in 1998, that’s a LONG time ago. The song is called “Summer in Dublin” and the band was one of the biggest Irish bands in their time, so big that U2 hoped they could be as successful. ;-) Bagatelle was founded in 1978 and this Saturday they are in the Bowery in Rathmines for a gig (not free: EUR 15). That’s nearly 40 years! This week donations came from Julia Sch, Helen B, Susan H and Paula R and with all the help over the last three week we just made it to clear the bill before the next one arrives. Thank you so much! Your help is much needed and VERY much appreciated. Without donations the Dublin Event Guide will not continue arriving in your Inbox every week! Your donation will benefit EVERY Dublin Event Guide reader, but no donations will eventually kill this resource for Dublin. Justin M, Susan F, Deirdre G, John F, Melanie B, Mark G, Martin O’Malley, Andrew G, Ornaigh G, Noel N, Serena F, Eamonn U, Gerard Ph, Fiona F, Gabriel K, Aislinn T, Barry M, Trudi C, Eugene G, Marc F, Susan H, Grainne O’S, Edita M, Joan S, Daire OC, David P, Anne H, Irene C, Comet Records, John F, Daniel E, Olivia C, Nora O’K, Joan S, David O’K, Tara R, Keith Y, Valentina S, Clodagh O’C, Philip W, Nina J, Michael McS, Trevor J, Edmund G, Ann McP, Noelle H, Adrienne L, Michelle M, Stephen S, Darren McG, Jutta B-S, Geraldine R, Ciara L, Melanie B, Finbarr McG, Catherine E, Paula Ralph, Orla C, Amanda O, Catherine G, Arthur D, Moira dF, Juliana AY, Elaine K, Ann M, Mark G, Julie Anne O’B, Bridget W, Sean S, Karen A, Melanie M, Zelie McG, Lisa H, Tim O’N, Isidro G, Laura B, Shane M, Brian McG, Shai C, Margo C, Majella M, Tania Z, Barbara Q-B, Sueanne O’H, Cornelia K, Kevin R, Liz D, Amanda O, Carmel M, Sinead W, Julia B, Rebecca T, Margaret M, Kay G, Darragh D, Carmel C, Derek S, Clodagh O’C, Bernadette B, Ellen B, Cristina B, Breda K, Mary K, Siobhan M, Jan K, Sean O’C, Bernice McM, Raymond M, Henrieta P, Albert McC, Marion K, Barry McD, Oisin B, Rita B, Fiona R, Rachael McC, Tara R, John F, Yvonne K, Katie D (Paperbear), Celina V, Ali McD (Fitality), Catherine G, Catherine F, Dean R, Colum F, Fiona D, Aoife H, Nicola W, Mary C, Valerie W, Pauline R, Sophie P-L, Sinead NiC, Gerard K, Milena V, Richard P, James E, Valerie A, Susan B, Sharon K, Michelle McN, Anita W, Ciara T, Noel R, Bill G, Lisa C, Catherine O’S, Tim O’N, Michael McS, Adrienne L, Niamh O’C, Retrogaming.ie, Danijel S, Noelle H, Barry O’H, Marcus H, Brendan M, Eric F, Caoimhe Ni M, Daniel Le G, Gordon S, Deirdre C, Mark G, Aishling B, Ana R T, Ann Marie S, Gerard B, Luz McC, Nicola R, Caitriona D, Eva B, Ann C, Jutta B-S, Moira dF, Roisin R, Tracey O’C, Donna M, Jessica G, David S,Brendan R, Joan S, Stuart N, Filippo G, Gergory F, Mark C, Deidre M, Howard L, Paul R, Linda McD, Isidro G, Gemma O’N, Aoife M, Anita W, Mark R, Clodagh O’C, Niamh D, Odhran K, Belinda B, Eimear L, Brian R, Andrew G, Marta T, Linda C, Grainne F, Rita B, Rosemary K, Mary McK, Ger O’B, Alison J, Sinead L, Lesley C, Noel N, Majella M, Mona O’R, Leigh P, Eric C, Anette K D, Aoife G, Aidan C, George K, Rita B, Thomas G, Roy C, Jutta B-S, Lorna O’C, Aisling McK, Miriam L, Fergus O’T, Julia Sch, Helen B, Susan H, Paula R and Travel Agency “Project Travel” (www.project-travel.ie Ireland’s only Norway and Northern Lights Travel Experts), Arthur’s Pub (www.arthurspub.ie A classic Dublin old-style pub in 28 Thomas Street with a new and buzzing music venue that runs lots of events), the Speedfriending Ireland Meet-up Group (www.meetup.com/Events-Drinks-Talks-Dublin/) (Where you can meet lots of new people and make friends), the Birdcage Bakery & Cafe (www.facebook.com/BirdcageBakery An independent cafe and bakery in 23 Harcourt Road, Dublin 2), Cycling Campaign (www.dublincycling.ie), www.FlamencoIndalo.com (A group that supports and promotes the art of Flamenco in Ireland), www.oliviercornetgallery.com (An Art Gallery in 5 Cavendish Row), www.thepaulkanegallery.com (A great Art Gallery, on the search for a new venue), www.cfcp.ie (The Centre for Creative Practices is the the only arts centre in Ireland dedicated to connecting, integrating and promoting immigrant, experimental and emerging artists among the local arts scene and audiences). This week there is the Malahide Has It Festival on Saturday and Sunday, Atmosphere (Ballons, Kites & Flight) Festival in Dun Laoghaire on Saturday and Hotter than July World Music Festival and the Dublin Flea Market on Sunday. If you want to reach more than 24,000 people with a product promotion or an event promotion for a non-free event, contact me on dublineventguide@gmail.com and we can discuss the options. You provide the prize for the competition and the Dublin Event Guide (for Free Events) runs the competition for you. Are you single? – Maybe the CSO wants to help!? Census results are usually released in batches by the Central Statistics Office (CSO), probably because it takes some time to gather all the data and the results are generated in batches and then are released. They should have differentiated a little more and added more granularity. There are six categories between 25.5% and 50.1% of single person households, but surprisingly NO further categories for the “<25.5%" or the ">50.1%”. That is an odd bias for one 25% wide segment. In addition they chose the colours badly. The 45-50% and the >50.1% categories look so similar that you can’t differentiate them in the map. Going by the map, it seems that WHOLE Dublin is a single zone, so no sub-areas are further detailed. And Cork, Limerick and Galway show the same level of singles. Malahide, by the way, is not the best patch if you are looking. Another surprise (but the inclusion of kids in the “unmarried” doesn’t help to get useful figures): While there are 1.963mio unmarried people, only 399.815 people live on their own. 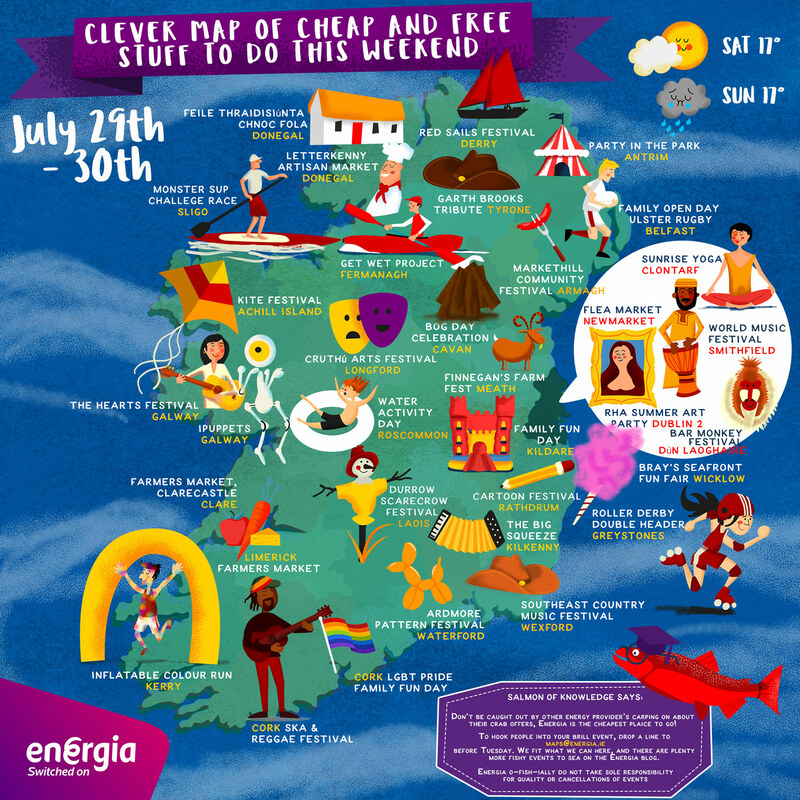 By buying through the ads in this Dublin Event Guide, you help the Dublin Event Guide! Thanks! Dun Laoghaire Rathdown is the leading example in the whole Greater Dublin area of top class historic events for everybody and Dublin City really could learn from them! The Summer of Heritage programme of events is a series of 30 free guided tours run by the Heritage Office of Dún Laoghaire-Rathdown County Council from 26 June until 03 September. The tours are suitable for families, historic groups and individuals interested in local history and some of the locations/tours are The Oratory, Seapoint Martello Tower, Holy Trinity Church Kiliney, Historic Dundrum, Kill Abbey, Obelisk Stillorgan, James Joyce Tower, Historic Blackrock, The Metals, Dun Laoghaire Harbour Walk, National Maritime Museum, Dalkey Castle, Monkstown Castle. Most tours happen a number of times during the week and the full programme can be downloaded here. Hot Press Magazine is celebrating its 40st birthday in June of this year and this exhibition in the National Photographic Archive will show every single Hot Press Cover from the last 40 years. A piece of music history of Ireland from 1977 until today. Oddly, the end date of this exhibition can not be found anywhere. On Saturday the East Wall History Group will host the second Sarah Lundberg Summer School in conjunction with the Alternative Visions Oral History Group and Radioactive International. CELEBRATING A CENTURY OF REBEL RADIO. During the Easter Rising a message was broadcast from O’Connell Street to the world announcing the establishment of an Irish Republic. And this was only the beginning. Be it Pirate Radio, Free Radio or Community Radio Ireland has a fascinating history of citizens taking to the airwaves. This event will look at the history of many of these achievements in broadcasting, you will hear the story of the local Irish stations from the 1970s and 80s onwards, the key role Ireland played in the famous off-shore pirate radio ships, and examining the motives behind some of the projects – be they political, a form of self-expression or simply the desire to play great music! The speakers will also examine why broadcasting regulations are so restrictive and discuss how new technologies are providing fresh opportunities for the determined enthusiast. Malahide is celebrating their Malahide Has it! Festival 2017 this weekend. Malahide might have it, but unfortunately the organiser don’t! The website hasn’t been updated since 2017 and the Facebook page below has an unreadable picture of the programme on it. So how people are meant to find out what is happening is not clear. But it is a busy festival with lots of things happening, so it would be a pity to ignore it. To give you the best possible chance to see what is happening, I have uploaded the festival schedule to this location. If you check the picture at that location, you should be able to zoom in properly and at least see a bit more. The quality is not great, because I only had the low Facebook picture quality but the “zoomability” is much better. On Saturday and Sunday there will be a Food Stalls from 10:00-17:00, Children’s Entertainment with Carnival Games/Free Face painting/Free Ballon Modelling/Magic Shows from 11:00-16:00 on the Green. In New Street Live Music (15:00-22:00), Kids Basketball and Carnival Games (11:00-17:00) and RNLI demo (11:00-17:00) will take place. A Fun Fair will be on Malahide Beach from 11:00-22:00. To celebrate the Easter Rising Anniversary, admission to that exhibititon was free in 2016, but lucky for us, Dublin City decided to also waive the admission charge for 2017. Come to this outdoor “Yoga under the Tree” class for a good cause. It is a 1 hour Yoga class on the Clontarf Promenade (opposite Oulton Road) to help the Make A Wish foundation. You just need a mat and some water. Suitable for all levels. The Drumcondra Village Market is re-launching this weekend as the “Art, Bites, Crafts Drumcondra Market”. And as you guessed it, it is an arts and crafts fair in the centre of Drumcondra. There will also be some food and live music with “The Jaffa Cakes”. The exhibition “The Beautiful Beasts” will feature a weird and wonderful collection of animal sculptures. Along with a brand new limestone seal, you will find a flying horse, a tortoise with a secret story and a toucan in disguise. Created by leading Irish and international artists from materials ranging from bronze, woods, ceramics, steel and stone. You can learn about the techniques used to create the artworks and feel samples of the materials used. This year’s Dublin Ratha Yatra, the Hare Krishna Festival of Chariots will take place on Saturday. It will begin at 11:30 at Merrion Square South and there will be a parade to St. Stephen’s Green. The Foothills Cafe in Sandyford is inviting to a Summer Party with Live Music and Children’s Entertainment. An Intercultural Tour in Mandarin Language with Community Ambassador Vicky Wang will take place in the Chester Beatty Library. As part of the Festival of Archaeology, the National Museum invites you to discover how the Vikings built their homes, then create your own Viking house and help build up the Viking town of Dublin. Admission is free. Thi is is a Drop-in activity in the Kildare Room. Suitable for Ages 8+. “Children’s Puppet Playtime” is your chance to perform your own puppet show at Famleigh House. Admission is free and access is on first come, first served basis. The time slos are 12:00-13:00 and 14:30-15:30. At 13:30 and at 16:00 a Puppet Show with Julie Rose McCormick will take place. Admission is free for that as well and access is also on first come, first served basis. On Sunday there is also Music on the Bandstand with the Stedfast Brass Band. Science Gallery is hosting the next Eurocraic event, a meeting for everybody interested in modular focussed synths. Come to the gallery to join manufacturers and users for an an afternoon focused on synthesisers, electronics and electronic music. Find out more details on the Facebook page below. A Ceremonial Military Guard will parade at the site of the “National Memorial to Members of the Defence Forces who died in the Service of the State”, at Merrion Square during July and August. Ceremonies will take place at the pyramid at Merrion Square opposite the back entrance to the Dail, every Saturday from 15 July to 19 August 2015. Units from different sections of the Defence Forces (Army, Air Corps and Naval Service) will participate in this Military Guard Ceremony to remember their comrades. Every week different units will be involved and the details of the ceremony and the participating units are described on the website below. Qigong is a traditional Chinese form of meditation coordinating slow flowing movement, deep rhythmic breathing, and a calm state of mind. Come to this gentle Qigong practice outdoors on the Roof Top Garden of the Library (weather permitting) or indoors with a view of the roof garden. Suitable for all ages. Admission is free and no booking required, but numbers are limited. The exhibition “SOUND CHECK” (09 June – 24 September) in the Science Gallery is looking the influence sound has on our life. THe exhibition looks at lots of interesting ways to create sound. It is highly interactive exhibition with lots of oppoertunities to create sound/make noise. Some of the main exhibits are a big sound pinball table, a synthesiser on a bike, musical swings, a room full of Moog Synthesiser equipment, a Uranium controlled Xylophone and there are fice “Sonic Bikes” that you cyn pre-book and loan out for a 1 hour guided tour in Dublin. The exhibition is suitable for ALL ages, even younger children will be able to take part and nobody will be bored. Use the help of the amazing mediators, who can explain everything you see, especially if you don’t want to read all the explanations that are next to every exhibit. For all tours meet at the Merrion Square entrance reception. Ya slip ta bang is an interactive composition mapped over the streets of Dublin that will unfold for you as you ride ‘sonic bikes’ along specific routes of the city. Accompanied by electronic music, the composition tells the story of recovering he roin addict Lucy Dolan as she returns to the city, revisiting important places in her life. The sonic bike is a bicycle with frame-mounted speakers that plays different sounds and music dependent on where the cyclist goes and how fast they ride, via a mounted location-sensitive system. The bikes can be rented for free for up to 1 hour on Thursday, Fridays, Saturday and Sunday between 12:30 and 16:00. The rules and conditions are on the website below and that is also where you book the bikes. Atmosphere is a Dun Laoghaire-Rathdown event featuring all things aeronautical at Newtownsmith Green in Dun Laoghaire. It will be all about flying with ballons, kites and flight, a trapeze show with aerial performers, hand balance, juggling, acrobatics and clowning. The Kite Zone will feature stunt kites, large static kites and tournaments. Master kite flyers will demonstrate their skills and creations and will give workshops on kite aerodynamics and design. There will be kite flying competitions and a chance to make your own kite in the “make and do” area. Don’t forget to bring your own kite! A Balloon Sculptor will produce a specially commissioned centre piece for the day and balloon modellers will show off their skills creating models of Planes, Animals, Cartoon Characters and lots more. The Fun Zone will feature Bubbleman and humungous bubbles, climbing walls, volleyball skills, seaside games and strolling characters. A weekly tour of the National War Memorial Gardens will take every Saturday from March until the end of October. Admission is free. “Meet inside the gates” it says here. innocent drinks will be in Merrion Square this weekend with a giant adult ball pool (coloured plastic balls for you to jump in). The event is called The innocent Green and it will run on Saturday 29 July and Sunday 30 July and is reserved for “big kids” only (above 16 years of age). You can also play a game of rounders, tip the can and fruit pong while waiting for your turn to jump into the big ball pool. And there will be innocent smoothies and Coconut Waters available as well. Sounds like lots of fun, BUT there is a problem! While admission is free, it was necessary to book tickets to get access and all tickets are gone. innocent however have offered to let walk ups in, but only if it is not too busy. So, you might be lucky, but there is no guarantee. The Collective is an evening of Music, Poetry & More in the Ranelagh Arts Centre. Find the line-up on the Facebook Page below. Admission is free. This is a BYOB event. Les Freres Zeugma is a an atypical 6-piece rock band from Paris, that plays rock ‘n’ roll with traces of funk, swing, klezmer, afrobeat and even a bit of psychedelism. The band Bodies will be in Sin É for a gig and their single launch. The Galway Street Club Band will play Blues/Rock/Reggae/Folk/Trad/Ska at this gig in Bray. The Beatles Tribute Band “Let It Be-Atles” will be in the Palmerstown House for a gig. Dublin-based 7 piece “The Crayon Set” specialises in upbeat, alternative pop and they are performing a gig in Whelan’s on Saturday. The gig will start at midnight. Admission is free before 22:30 or if you sign up for the guest list via the link below. Finally since last year, guided tours were provided and were meant to run for three months until end of October 2016. But the interest was so great that the OPW decided to continue the tours with a reduced schedule over the winter. And since 02 April there will be tours again every Friday and Sunday at 10:00, 12:00, 14:00 + 15:00 and only 20 places are available on each tour. Every Sunday (with a few exceptions) an art workshop takes place for children from 6-11 years of age. Admission is free and children must be accompanied by an adult. The National Gallery is running a series of free themed family drop-in workshops from 11:30-13:30 every Sunday. Inspired by the collection and the exhibitions in the National Gallery, these workshops are suitable for all ages from approx. 18 months to age 8. You can choose to stay for as long or as short a time as works for you. The space will be divided by age and ability, and each child will be encouraged by Artist and NGI Education Assistant Caomhán Mac Con Iomaire and the week’s guest artist to create their own work on the week’s theme. Admission is free and no booking required. Numbers are limited to 40 people at any one time but you can drop in and out whenever it suits you and as long as there is still space. Children have to be supervised at all times. The event takes place in the Atrium. The kids from Al Helal FC in the Gaza strip are returning to Ireland and coming to play Ballybrack FC this Sunday. The Ballybrack Boys Football Club is looking for your support and solidarity and they have organised a DJ, bouncy castle, food and football. The cemetery at Arbour Hill is the last resting place of 14 of the leaders of the 1916 Rising. Among those buried there are Pádraig Pearse, James Connolly and Thomas Clarke. This tour every Sunday will focus on the context of the Rising and explore in detail the wording of the Proclamation of the Irish Republic. No booking necessary. The meeting point is inside the cemetery gates. The Japanese film “Sweet Bean” (2015, 113min, PG) will be screened in Japanese with English subtitles and admission is free. On 16 Sept is the International Zouk Day and on that day a dance Flashmob is planned to happen in Dublin and for the next seven weeks, starting this Sunday, a Dance Practice will take place at the Pavilion/Summerhouse in St. Stephen’s Green (next to the lake). It is a 2 hour session and you will learn to dance this Brazilian partner dance that was born in Rio de Janeiro less than 30 years ago (early 1990s). You don’t need to have and dance experience and you also don’t need to have a partner to participate. The Facebook Event Page unfortunately doesn’t mention if there is a cost, so until I hear otherwise, I will assume that admission is free. Let’s hope I am right! This is a public tour of the Eileen Gray gallery, exploring one of the most influential designers and architects of the 20th century. Admission is free and places will be allocated on a first-come, first served basis 15 minutes before the tour starts. Suitable for adults and children aged 7+. + Dance Performance “Welcoming The Stranger” by Catherine Young combined with traditional West African dance, Palestinian Dabke dance and Traditional Irish dance and accompanies by a collective of Irish musicians, Big Bang Dance Project drummers, and Raed Said. There will also be interactive Drumming Workshops for children (at 15:30+16:30+17:30), Japanese drum performances by Taiseiyo Taiko Drummers, Mexican mariachi classics by Mariachi San Patricio and traditional Chinese Lion Dances. The Sunday Melt Sessions in the Mezz is a whole afternoon of bands, acoustic acts, spoken word, DJs and more. The line up is available via the FB Event Page below. And if you don’t know how to dance, don’t worry! Workshops are provided and admission is free, donations are appreciated. The “outdoor” version of the weekly dance continues this week in Merrion Square in the area on the side of the National Gallery. The Crayon Set will play an Indie / Alt Pop gig in Bray. Soul Foolishness are playing Funk, Hip Hop and Soul at this gig. At 23:30 a GoFUNKyourself DJ will take over. Emily Gallagher will run a ‘just for fun’ photo trail weekly, involving participants following instructions for hunting for various specific snaps around the city centre, after which interpretations of the symbolic significance to the snaps will be shared! Admission is free, but donations are welcome and booking is required via chooseyourowntracks@gmail.com or 085-2725095. Meeting Point is the Meeting House Square. The weekly Stand-up Comeday gig in the Bowery is run by David Hynes and Danny O’Connor. Guests are Julie Jay, Mustafa Saed, Terry Oneil, David Mallaghan. This is a weekly gig with authentic old-time fiddle tunes and Appalachian music. Great news the great duo of Donal Kirk and Anto Drennan have found a new home. Originally they played a weekly gig in JJ Smyth’s until it closed and now they will perform in the Leeson Lounge and the same day as before. They will play music from Lowell George Little Feat, Bonnie Raitt, Free, Bad Company, Crosby, Stills & Nash, Beatles, Bobby Bland, Vince Gill, Ray Charles, Etta James, Elvis, Ry Cooder, Dobie Gray, Guy Clarke, early ZZ Top, Dave Edmunds, Stevie Ray Vaughan, Willie Nelson. This is a short and informal talk in front of Guido Reni’s The Suicide of Cleopatra, with Aoife Brady. Eason’s are inviting to an evening with E. Lockhart, Jennifer Smith & Carlie Sorosiak in Eason O’Connell Street. There will be chat, Q&A and a book signing. The Trad Session “Call the Dancers” will take place and no other than well known musicians Ronan Ó Snodaigh, Eoin Dillon & friends will perform. “Coastal Erosion and Pollution” is the topic at the next meeting and Karen Dubsky (Co-founder of Coastwatch Europe and marine ecologist in TCD) will be talking about this and the many challenges and pressures facing our coastline. Karen co-designed the Blue Flag for Beaches award programme and co-founded the Irish Clean Air Group, which successfully lobbied for the introduction of smokeless fuel in Ireland. Camden Comedy is a weekly comedy night on a Tuesday that I only found recently. Every Tuesday they have a whole range of comedians and admission is free. The Trad Stage is a weekly Open Mic event in the Tivoli Backstage venue. Musicians are invited to perform live in front of an interested audience. Performances are primarily of Irish Traditional Music and Folk Singing, however it is possible to also see performances of traditional music from all over the world as well as performances of original compositions from local and international musicians. “All Aboard! An open mic night on a Pirate Ship.” seems to be the new name of the Bowery’s Open Mic Tuesday. For years, this event was one of the most popular monthly events with a HUGE amount of people taking part. But since last month, it was more or less terminated for all of us in Dublin. The Free Wednesday (currently) still continues outside of Dublin, but the interesting heritage sites in Dublin have been removed from the list. “Free Wednesday” is the first Wednesday every month when entry charges at some state-owned heritage sites are waived. Regrettably Kilmainham Gaol and Dublin Castle were removed from this great initiative and The Casino in Marino is still closed for an indefinite period of time, so the only site in Dublin that is still taking part (for another bit!?) is Rathfarnham Castle. free of charge. The full list of sites in Ireland is here. However, as you can imagine, this event is very popular and therefore it is strongly recommended to arrive early at the venues. Once the day’s tickets are given out, you will not get access anymore. The yearly RDS Craft Awards showcase and reward excellence in Irish craft and it is an open platform for Irish craftspeople to have their work assessed by an independent judging panel of Irish and international craft experts. Each year, the winning and commended entries are showcased at the RDS Craft Awards Exhibition during the Dublin Horse Show and prize winners are exhibited again at the National Crafts & Design Fair in the RDS in December. But to see the exhibition during the Horse Show you need a ticket for the Horse Show and to let everybody else see the great craft, the exhibition will be open for free for three days BEFORE the Horse Show starts. From 02-04 August admission is free. Come to the museum to learn about how people in Stone Age Ireland caught their dinner and make your own paper fish to take home. Admission to this Drop-in activity is free. It will take place in the Kildare Room. Suitable for Ages 8+. The Temple Bar “Night” Market is more an afternoon and evening market (14:00-20:00) and it takes place every Wednesday until September. The Resident Open Mic is a new weekly open mic on Wednesdays with a bit of a difference: Each week a different established artist will go back to their roots by not just playing at the open mic but by hosting it. This gives the artists a chance to try out new songs, play some of their classics and most importantly it gives a chance for new songwriters to play their music in front of some of their favorite songwriters. Drop into the Discovery Zone of the Natural History Museum to find out about the Irish Peatland Conservation Council from the Bog of Allen Nature Centre in Co. Kildare. See up-close some living native species from the bog, such as newts and water boatmen, as they visit Dublin for the day. The Astronomy Show is the title of the show presented by Junior Einstein’s Science Club. The Junior Einstein invite children from 8-12 years of age to join them on a virtual trip through space – everything from astronaut training to rocket launching to protecting astronauts on other planets, even greeting aliens and getting back to Earth safely. Admission is free, but places are limited and booking is required. The talk “Privately Commissioned – An Examination of Surimono, Books and Paintings by Hokusai” with Dr Ryoko Matsuba (Research Assistant, Late Hokusai Project, SOAS, University of London and the British Museum) will take place. This is a tour of the exhibition “Yeats: The Life and Works of William Butler Yeats” on the first Thursday of each month. The tour introduces William Butler Yeats (1865-1939) – one of the great poets of the twentieth century – and his many interests, including literature, folklore, theatre, politics, the occult, and Irish cultural identity. After the tour, you can listen to a selection of voices speaking some of his best loved poems, including Easter 1916. THe Thursday Night Board Gaming event is running for more than 10 years already and it is a weekly event for all Board Game enthusiasts. But even if you are a Board Game newbie, you are welcome. Just come along! The Luna Boys are in the Mercantile for a gig every Thursday night. The Swedish Railroad Orchestra is not an orchestra, but is electronic music live performer Rob Smith. He will perform a gig on Thursday. Mick Pyro is bringing his friends, all top musicians from other bands for a night of Soul Funk & Blues. Pop Punk band Hello Casanova from Armagh and four piece alt rock band Hand Models from Belfast will be in Whelan’s for a gig. ArlixMeet is a series of conferences happening all over the world to bring teen entrepreneurs together. The conference in Dublin will allow teens who have businesses or who are interested in business to meet, share and learn. Network and create unique connections, share ideas, dreams and stories of your path in entrepreneurship or what you want to do in the future. Admission is free, but booking is requried via the link below. The event will be in Room 5-050. This is a short and informal talk in front of Jan Steen’s The Marriage Feast at Cana, with Kate Drinane. A walking tour in the garden of Farmleigh House will take place on Friday with Marie Staunton. Meet at the Walled Garden. The Howth Jazz & Blues Festival is back on the August Bank Holiday weekend. There will be lots of Jazz & Blues gigs in Howth from Friday until Monday and all gigs are free. More gigs will follow on Saturday, Sunday and Monday and I will list them in next week’s Dublin Event Guide. “Fossil Free TCD” and the “All Ireland Student Activist Network” are inviting to a pot luck dinner on Friday and everyone who does good work on environmental and social issues is welcome. Bring a dish and something that makes you happy or that you are passionate about to show to others. There are some suggestions on the Facebook event page but there is no pressure. Admission is free, but a donation of EUR 5 is suggested to pay for the space. The Dublin Blues, Roots and Brass Festival is back for the 3rd year on the August Bank Holiday weekend and it will run from Friday until Sunday (unfortuantely not until Bank Holiday Monday). Some of the best and most unique acts from around the country will perform at this festival in Whelan’s on the Upstairs Stage, on the Main Stage and even on a Street Stage. Admission to all gigs is free. This is a solidarity gig for musician, academic and campaigner Robbie Sinnott, who is blind and was recently mugged and assaulted by two criminals in Dublin, who specifically targeted him because he is blind. And it is also a campaigning for Hate Crime legislation to be made part of Irish Law. A whole range of artists/performers will perform music, poetry and theatre on that evening. The line-up can be found on the Facebook Page below. Admission is free, but donations are expected. “Catch A Fire” will play a gig in the Grand Social with music from PeterTosh, Bunny Wailer & Bob Marley. “Gavin Povey and The Fabulous Oke She Moke She Pops” will play New Orleans style Piano Rhythm & Blues, Boogie Woogie and Rock’n’ Roll. Gavin Povey has played piano with Van Morrison, Finbar Wright, Kirsty MacColl, Steve Cropper, Shakin’ Stevens and many more. The Doors Tribute Band “The Roadhouse Doors” will be in Drumcondra for a gig on Friday. The great 6-piece Ska band “The Bionic Rats” are playing a gig on Friday. There is only one single walk this month. Pity, considering the weather is better now than in the rest of the year. The walk is on 22 July. Get A Loan and a Present of EUR 6 – Crazy Finance World! The first loan was probably arranged more than 2500 years ago and for the whole time since then, the principle of loans was that the person loaning money will have to pay for the loan through an interest rate. So over the loan period, more would be paid back to the person or “institution” that loaned the money than the loaner got in the first place. Makes sense to all of us even if we don’t like it if we are the ones needing the money. For bigger money deposits many European banks already charge money to keep the deposit for their customer. This is also a negative interest rate, but in the other direction. Bank of Ireland does that already for a while for their big customers and now the AIB has announced it as well. Imagine the bank took money away from you for your little bit of savings? (Well, they do through administration charges already, but they could take even more.) At the moment the penalties are only for big institutional depositors, but who knows what direction things will go….same thought as with the negative loan rates. It is a crazy world out there! Copyright 2017 by Joerg Steegmueller.